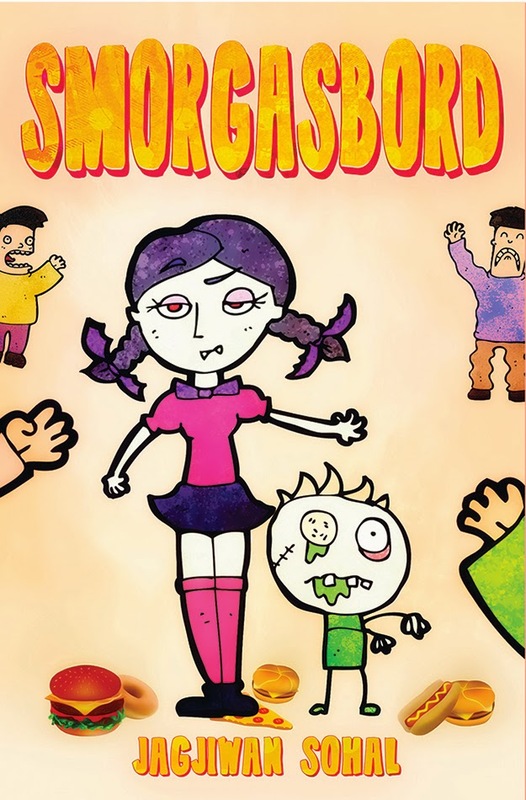 For the next 7 days, “Smorgasbord” by Jagjiwan Sohal will be on sale for only $.99 on Amazon and Barnes & Noble. This book has nothing but 5 star reviews so far! See the quotes below! THIS AUTHOR HAS A FUN AND WACKY SENSE OF WRITING. 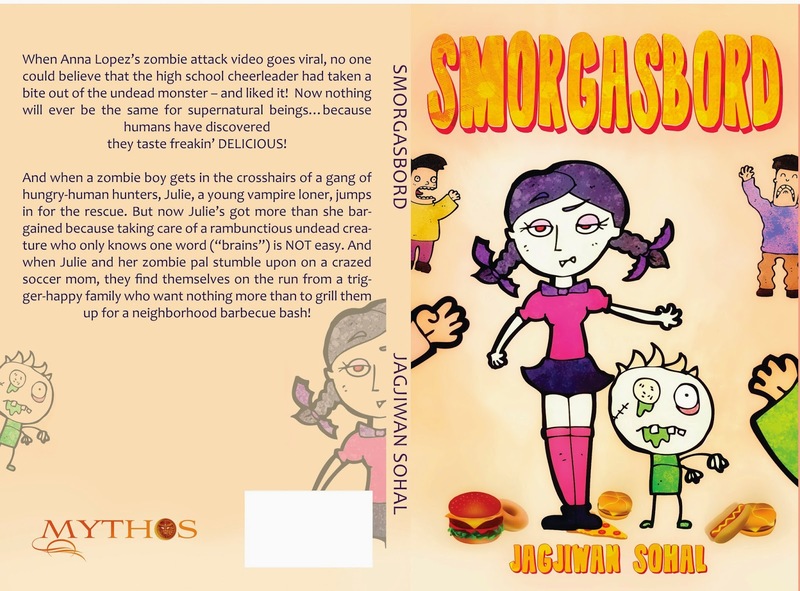 THIS BOOK HAS ZOMBIES, THOSE FLESH EATING, UGLY AND SMELLY MUTANTS BUT DEF NOT YOUR TYPICAL ZOMBIE STORY. ITS A FUN READ FOR ANY AGED GUY OR GAL. Reading & Discussing this creatively adventurous novel with my sub-teen was a blast!There are several characters that make this book amazingly unique, but our main focus is on Julie, a teen vampire, and a zombie- child whose only vocabulary is “brains”. While these two run for their lives, they’re lucky enough to encounter more paranormal creatures with the same problem: they’re the newest culinary fad. Unfortunately, there’s a psychotic woman leading a group of hunters that makes Ted Nugent look like Mr. Rogers. Throw in a zombie rancher, his spokeswoman, and a reporter scorned, and you have one heck of an adventure! For the record, I’m not a zombie fan, but I truly enjoyed this book! This author is brilliant! I highly recommend picking this one up! As a parent, I must warn that there is some descriptive violence involved here. Although my son & I had a wonderful time reading this, I wouldn’t recommend this novel for children below the 6th grade. I was gifted a copy by the publisher in exchange for an honest review. Do you like having cookouts in the summer? Well, what about a smorgasbord? This book is totally out of my comfort zone as a reader and I loved it! I am normally not the zombie/vampire fan and I’m here to tell you, this is a fun summer read! Great for all ages, young and old. The story centers around Julie, who was born as a vampire when she was a teen. She is older, but still lives in her teen body. She saves a little zombie boy from danger and takes him under her wing, staying clear of humans. Yes, in this story, humans hunt ghouls of all kinds, and serve them up at the annual Monster Mash Food Festival. I don’t think I would personally like to eat a zombie or a werewolf and vampires are hard to catch, so that’s way too much work for me. But the suburbanites, also known as the Wilkerson family, work hard to kill the ghouls in the neighborhood, even by teaching their children to shoot them dead. Our main vampire, though, snacks on veggies only. I loved that this story was like a car chase, not knowing what was around every corner as Julie protects the zombie boy while trying to outwit the Wilkersons. She learns to fight for her survival and makes many friends along the way. Sohal makes us root for the monsters, which I thought he did brilliantly. Also the big plus was learning about Julie’s past. I connected with her during this flashback as she tells the zombie boy a bedtime story: The story of her early vampire life. The only disappointment for me was, I was hoping to read more about the ghosts. I found it clever that ghosts were drank, not eaten, hence the term: Spirits. Highly recommended for a fun summer read, fast paced, and keeps you on the edge! I really hope there is a book two in the works, because I cannot wait to get a copy!